WASHINGTON - Exactly 125 years ago an Atlanta pharmacist mixed up a cure for headache and fatigue and stumbled upon the recipe for what has become one of the world's most recognizable drinks and brand names. Coca Cola is celebrating the moment when on May 8, 1886 John Pemberton made his way into American culture, creating a soft drink now sold in more than 200 countries and earning the company a place among the world's top 100 firms. 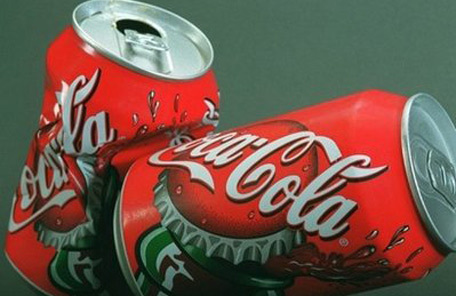 Regular Coke, as opposed to its numerous offshoots such as Diet Coke, remains the world's favourite soda with a whopping 17 per cent market share, trouncing its rival Pepsi. The recipe is a closely guarded secret passed down through the generations, and according to legend safely stashed away in a company vault. "The Coca Cola saga has been reverentially preserved and nurtured over the years," writes author Mark Pendergrast in his book "For God, Country and Coca-Cola" which relates the history of the drink. The official version of events in this rags-to-riches story "has all the earmarks of the class American success myth." According to the legend which has grown up around Coke the poor but kindly Pemberton was transformed from a dishwasher into a millionaire. But in reality Pemberton was no grumpy, herbal doctor who unwittingly brewed up his magic potion in his backyard, Pendergrast maintains. Coca-Cola was a typical by-product of "the golden age of quackery" at the end of the 1800s when many doctors were trying to patent all kinds of cures and medicines for a variety of ailments. Pharmacists and quacks offered their wares for sale on every street corner amid a growing clamor in the developing industrial age for effective cure-alls at the infancy of modern medicine. The original Coca Cola most likely tasted different from the liquid today, Pendergrast notes. "It was like many such other nostrums, a patent medicine with a distinct cocaine kick." Pemberton is thought to have discovered his new "miracle" medicine on May 8, 1886, and dubbed it Coca-Cola. But at the start the public eschewed his marvelous new elixir and in the first year he only sold on average nine glasses a day. It was in 1888 that business began to bubble when entrepreneur Asa Chandler bought the rights and began to mass produce this "medicine" as a refreshing soft drink. Within just a few years, Coca-Cola was a favorite beverage around the United States. The brew only made it across the Atlantic and into Europe in 1919 where it first appeared on shelves in France, before arriving in Germany in 1929. But apart from its business success, Coca-Cola is above all a cultural phenomenon. It remains one of the world's favorite drinks despite concerns over its sugar content, amid rising obesity levels especially among children. Last year the company had a net revenue of about $35 billion (S$43 billion), leading to profits of almost $12 billion. Selling more of the soft drink to children would be a "public health disaster," says Michael F. Jacobson from the Center for Science in the Public Interest lobby group. But it's hard to defeat such nimble marketing and overturn a brand image which has turned Coke, which its distinctive red and white label, from a mere consumer product into an object of desire, argues Constance Hays in her book "The Real Thing: Truth and Power at the Coca-Cola Company." "Through relentless advertising, clever marketing and sometimes plain old luck, Coke came to stand for the glamorous, prosperous, flag-waving side of America, the part that always looked forward, not back," she writes. Coca-Cola is celebrating its birthday with a huge concert on Saturday in Atlanta streamed live on the Internet. And the secret recipe? That remains firmly under lock and key even if some people claim to have already discovered the right ingredients. Muhtar Kent, chairman and chief executive, said in February that Coca-Cola was entering 2011, its 125th year in business, "with solid momentum." "While we recognize that challenges remain in our worldwide marketplace, we are confident that we are advancing our global momentum to deliver long-term sustainable growth and value for our shareowners," he said. 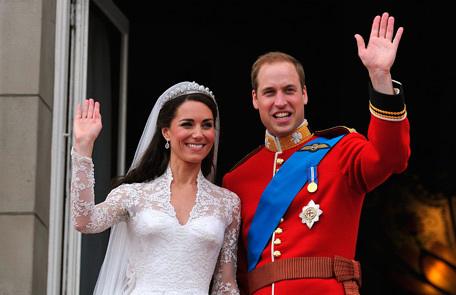 Prince William was afraid that he might pass out from the heat in the Abbey on his wedding day. Adjustments made to his wedding-day uniform, after fearing the heavy woollen material would make him pass out from the heat, reports Daily Mail. The daily said, "The Prince commissioned military tailors Kashket and Partners to make his scarlet Irish Guards colonel's uniform - but they added sweat pads under the arms, material to absorb the heat, and reduced the padding after the Royal groom expressed fears that the temperature in Westminster Abbey would make him sweat profusely, or even pass out." Company chairman Russell Kashket told the UK paper: 'He was very aware of the heat factor in the Abbey because he knew all the lights would make it very hot. 'He said he didn't want to faint, so we made some minor adjustments to ensure his comfort and save his blushes. 'Everybody worries about what the bride will wear, but no one seems to think that the groom also wants to look his best on the day. Men can get just as emotional as girls. Kenton Cool, the Briton with the most ascents of Mount Everest to his name, has now broken another record – by becoming the first person to send a tweet from the summit, reports The Sun. 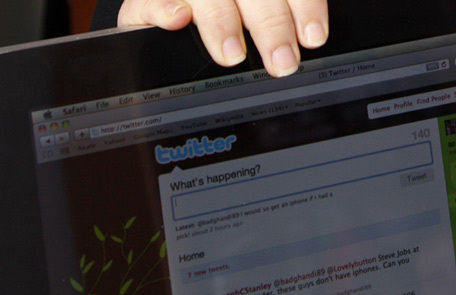 The 37-year-old ascended the Everest for the ninth time and posted his message on social networking site Twitter. The feat became possible after the Nepalese mobile network operator Ncell installed a 3G station at the mountain’s base camp last October, said the UK daily. 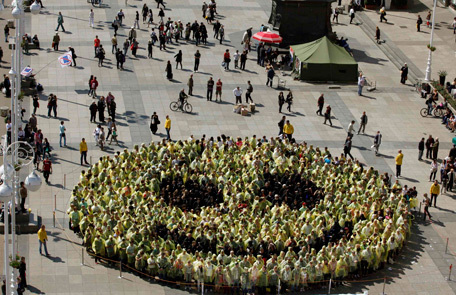 CROATIA: A crowd of up to 768 people grouped together to dress in black and yellow to create the biggest human smiley in the world on Zagreb's main square in Croatia. Their efforts on Saturday were said to have broken the Guinness World Record, smashing the previous record, which involved 551 participants and was reached in the Latvian capital of Riga, reports Daily Mail.